Don't tell the snow, but some records aren't meant to be broken. 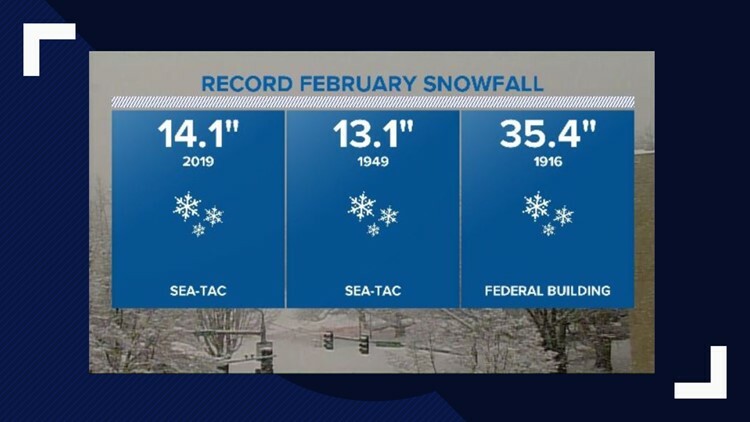 By Sunday evening, Sea-Tac International Airport recorded the largest snowfall total for the month of February. According to the National Weather Service, the airport saw 14.1 inches in the first 10 days of the month. The old record at Sea-Tac was 13.1 inches, recording back in 1949. Sea-Tac's records only go back to 1945. The old Federal Building in Seattle recorded 35.4 inches of snow in February back in 1916. It's unlikely that we'll surpass 35 inches of snow this month, however, there are still two weeks left in February.